The European Bioenergy Research Institute (EBRI) at Aston University in Birmingham, UK has developed a new renewable energy technology for biomass conversion that is transforming the lives of farming communities in rural India. In the Punjab region of India, farmers regularly burn excess straw left over from their wheat and rice harvests. 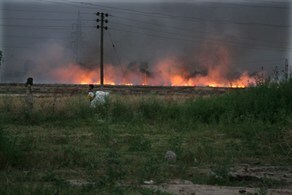 Research suggests that farmers in India burn around 116 million metric tonnes of crop residue. This burning process has a negative impact on the environment and economy as this straw is wasted and has serious implications on health and society due to the smoke and fumes produced. EBRI’s patented technology - a Pyroformer™ - takes waste products and residues (such as husks and straw) and converts them to energy in controlled conditions. The process generates oil, gas and biochar. Farmers regularly burn excess harvest residues despite this being illegal as there are limited alternatives. A further bi-product, biochar, is produced which can be used as a fertilizer and is proven to dramatically increase crop yields. Local and regional media learn more about the project and technology. The Pyroformer™ is housed in a container unit that can be transported between these villages and will be operated by the villagers themselves. This technology has the potential to stimulate growth and provide a cost-effective, reliable and sustainable form of decentralised power generation to address the local needs of heat and energy. 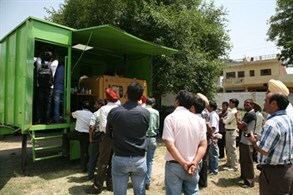 In July 2013, two events were held in India to showcase the work of Energy Harvest and the progress of the project to date. These events took place at IIT Ropar (2nd July) and at the British Council in New Delhi (3rd July). Both events featured a series of presentations by key members of the Energy Harvest project team, as well as a screening of a video that has been made of the project’s work, plus a visit to see the mobile unit in operation. The events were well attended and created a huge amount of interest from business, industry, government, academia and the media. It is clear that this project has struck a chord with people within India and beyond. They too want to be involved and to make a difference. It is also very clear that there needed to be increased Indian involvement and investment. With this in mind, Aston University and IIT Ropar are currently in the process of establishing a social enterprise/charitable trust to further develop this concept and technology in India. The charity will be responsible for raising the funds needed for the next phase: a further 5-6 mobile units to conduct further testing and business modelling throughout India.